Sorry. It’s just that I have Galaga sound effects stuck in my head. More specifically, my brain is trained on the sounds of evil bugs flitting menacingly toward the bottom of the playfield. I think Galaga might be my favorite arcade game, after Arkanoid and, uh, Gyruss. Oh, my god! Puttin’ the “childlike” back into “childlike wonder”! The La La Ling website has really, really good copy, all these ridiculous and distinctive product descriptions. 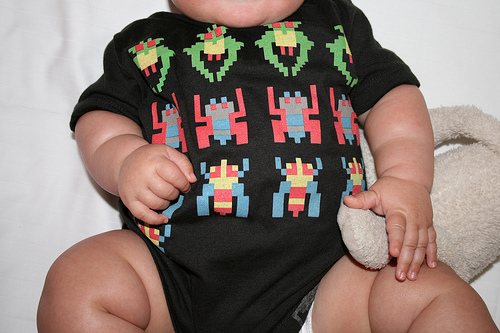 And La La Ling’s baby jumpers and t-shirts are just so rock star. In related clothing news, my Playing God t-shirt already has a hole in it. 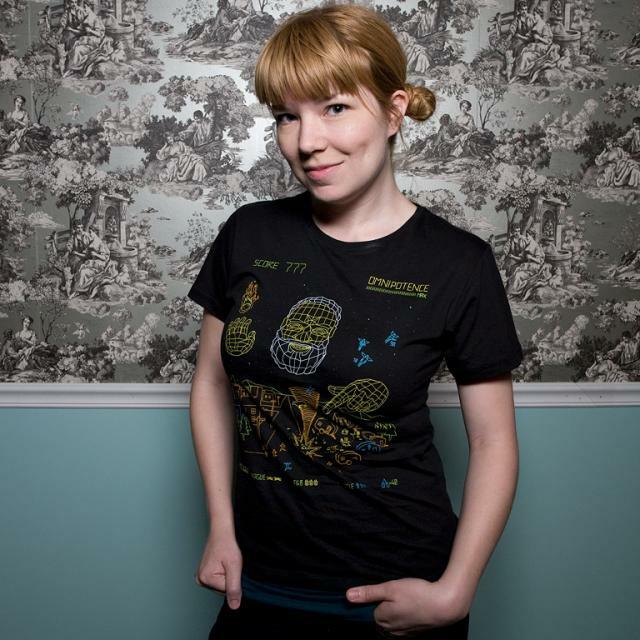 Video game -themed shirts are a dime-a-dozen, but exceptional game shirts are our white whale. And although that metaphor doesn’t hold up to scrutiny, “Playing God” combines our deep-seated fears of determinism and the Lord’s wrath with our boundless love for vector art. Plus, look how cute it is with pigtails! 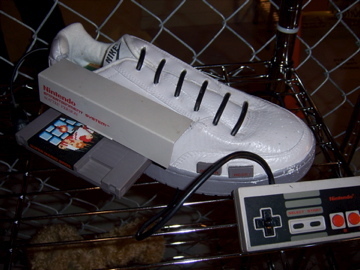 From the latest Sneaker Pimps art show (via). We’re tremendous fans of the Sneaker Pimps show—we attended one in Chicago last year—and we’re really anxious to ascertain the identity of this shoe’s artist. Still, this leads us to believe that the owner of Boston shoe store Concepts would know. We’ll try to find some contact information. Till then, send tips.